Jay Hopler’s Green Squall is the winner of the 2005 Yale Series of Younger Poets competition. 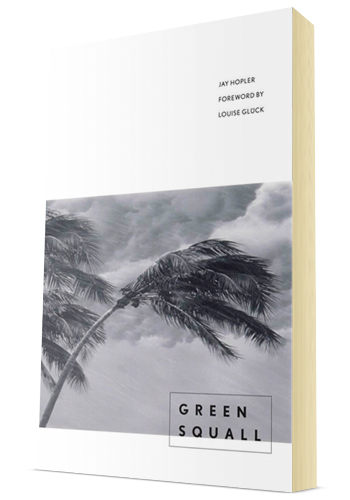 As Louise Glück observes in her foreword, “Green Squall begins and ends in the garden”; however, Hopler’s gardens are not of the seasonal variety evoked by poets of the English lyric—his gardens flourish at lower, fiercer latitudes and in altogether different mindscapes. There is a darkness in Hopler’s work as deep and brutal as any in American poetry. Though his verbal extravagance and formal invention bring to mind Wallace Stevens’s tropical extrapolations, there lies beneath Green Squall’slush tropical surfaces a terrifying world in which nightmare and celebration are indistinguishable, and hope is synonymous with despair.